The Adventurous Journey section gives participants the opportunity to do adventurous activities in new environments, as part of a group of four to seven participants. The idea is to take the group (which cannot be a family group) out of their comfort zones - to travel away from habitation, using any non-motorised mode of transport (which can be mixed to make the journey more interesting) - all while staying within a safe setting achieved through suitable training and supervision. Non-motorised modes of transport include walking, cycling (not e-bikes), horse riding and self-powered water transport such as kayaking, rafting and canoeing. 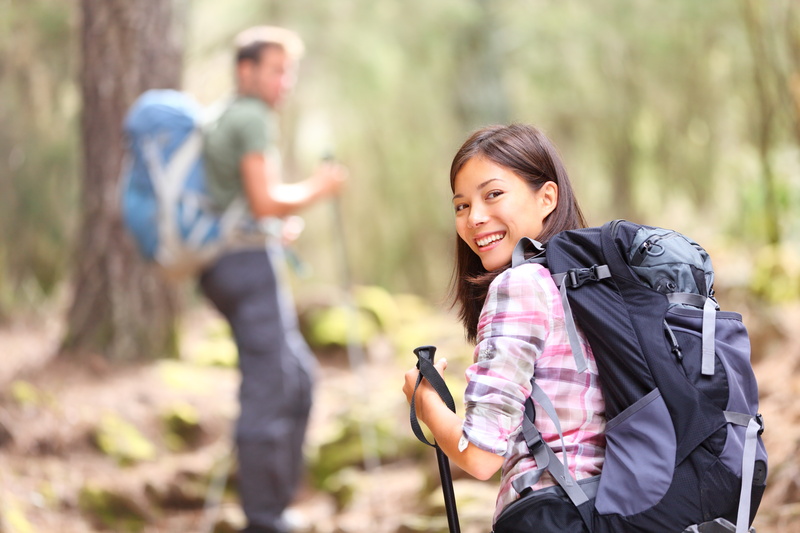 It's important to note that an Adventurous Journey group passes or fails as a group. The only exception to this would be if a participant had to leave the group and return home (usually because of sickness or injury) this would not cause the group to fail. What types of journey are involved? What are the requirements for an Adventurous Journey? have a purpose - this needs to be something that encourages them to notice their surroundings. This could take the form of an arduous journey or other physical challenge (Expedition), or a practical research study (Exploration). Early on in the process, participants need to give thought to what their purpose will be and consider whether it relates to the interests and abilities of the other team members. undertake the journey in a group of between four and seven young people. involve all team members in planning and preparation for the trip. camp in a tent or hut throughout the journey. If the journey is an Expedition, the group must camp in a different place each night. If the journey is an Exploration, the group can camp in one place (base camp) for the duration of the journey. prepare a substantial meal each day. undergo Training, then enough Practice Journeys to ensure they will be self-reliant and safe when they finally set off on their Qualifying Journeys. 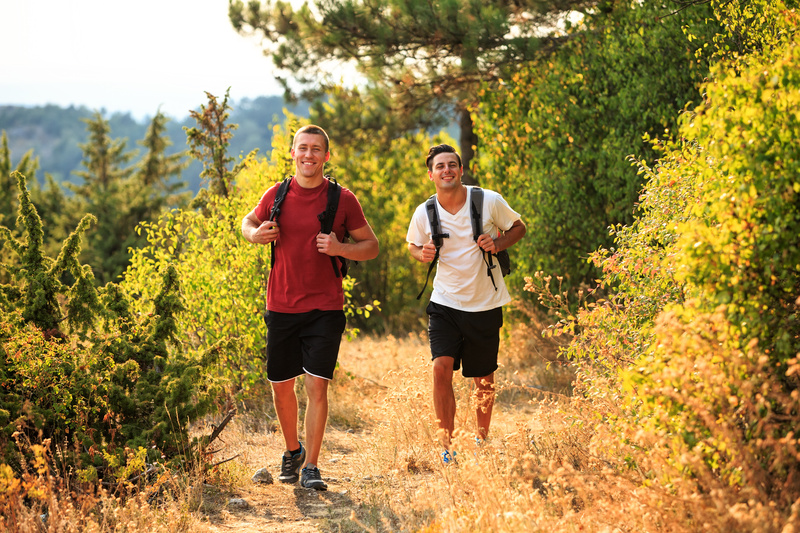 pack and take equipment that is suitable for their journey and the environment they will be living in. What's the process for planning and doing an Adventurous Journey? How long does it take to complete an Adventurous Journey? 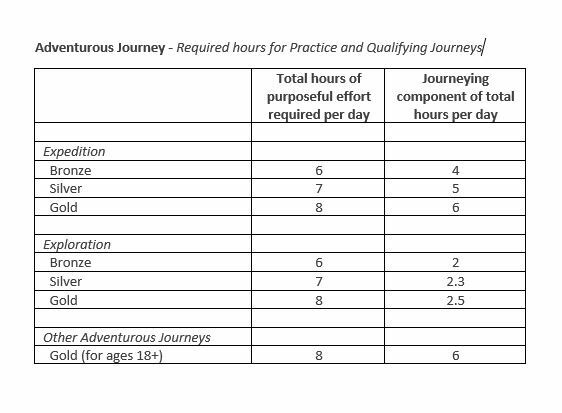 In addition to the 20 hours of structured learning required for Training, every Adventurous Journey (both Practice and Qualifying) has a required number of hours that participants must spend in 'purposeful effort'. This is defined as time spent towards accomplishing the purpose of the journey. How far does the group have to travel? Adventurous Journeys are defined by hours of activity (see table above) rather than by compulsory distance. What are the requirements for direct entrants? There are additional requirements for participants who are starting their Silver or Gold Awards without having completed any previous levels (this is known as 'direct entry'). These requirements are outlined in full here. Who supervises and assesses an Adventurous Journey? All Adventurous Journeys (both Practice and Qualifying) must be supervised by a suitably qualified and competent adult - known as the Supervisor - who is familiar with the Award, and satisfied that the participants are properly trained and equipped to undertake the journey. The Supervisor is responsible for the group's safety while on the journey, including 'shadowing' the group. Although the International Handbook suggests that Supervisors make contact with their groups once a day, in New Zealand, our environment and terrain is particularly rugged, so 'shadowing' (i.e. following the group) is necessary for two reasons. Firstly, during the Practice journey to observe them in action and determine whether any additional training is required and, secondly, for safety reasons during both the Practice and Qualifying journeys. 'Shadowing' requires Supervisors to remain close enough to the group to prevent any dangerous, or potentially dangerous, actions or behaviour - the actual distance will vary according to the weather and terrain but, as a guideline, you should be able to hail the group if (for example) they are about to attempt to cross a swollen river and you want them to stop. If certain aspects of the Adventurous Journey (such as the remoteness of the location, or the difficulty of the terrain) require a higher level of supervision, Award Leaders are advised to use their organisation's Safety Management Systems to determine the appropriate supervision structure for the circumstances. The Duke of Edinburgh's Hillary Award is not responsible for incidents caused by inadequate supervision or risk management. See the EOTC Guidelines 2016 or supportadventure.co.nz for additional guidance. All Qualifying Journeys need to be assessed by an Assessor - a responsible adult that is not a family member and who has considerable (usually three years or more) knowledge of the chosen activity - whose role is to 'shadow' the group in order to determine their competence during the journey. The Assessor approves the Qualifying Journey in the participant's Online Record Book to show that the trip has been completed, if he or she believes the group could have done the journey on their own with no supervision or assessment. The Supervisor and the Assessor may be the same person. The only time a form is required by the Award is for a Qualifying Journey at Gold level. The Gold Adventurous Journey Approval Form needs to be completed, signed and returned to marie@dofehillary.org.nz six weeks before the intended trip date. By completing the form, the Award Unit accepts full responsibility for developing and implementing the safety guidelines for the activity. National Office will check the form to ensure that all of the Award's processes have been complied with, and issue an approval number. Original generation time 3.1517 seconds. Cache Loaded in: 0.1113 seconds.